Kathy Gaffney and Laurie Kazan-Allen were amongst five activists whose work was today (November 16) recognized by the Construction Safety Campaign (CSC) at its Annual General Meeting in Birmingham. The Robert Tressell Awards were presented during a ceremony which took place this afternoon at the Priory Rooms in Bull Street. These honors, named after the author of the renowned 1914 socialist novel The Ragged Trousered Philanthropists, are bestowed for services to working people. 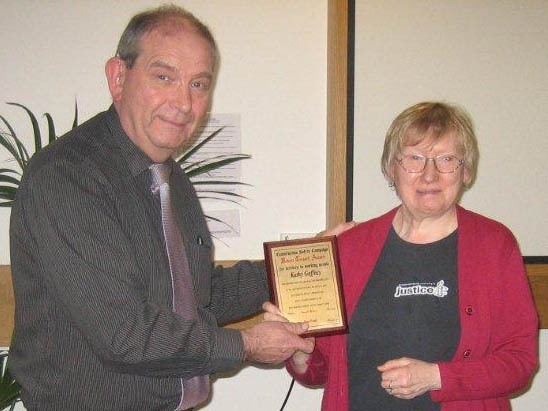 The citation for Ms. Gaffney highlighted her health and safety work, her organization of Workers Memorial Day events and her participation in the founding of the West Midlands Asbestos Victims Support group, a Birmingham-based group which provides a lifeline for asbestos sufferers and their families. The CSC's John Flanagan presenting the award to Kathy Gaffney. 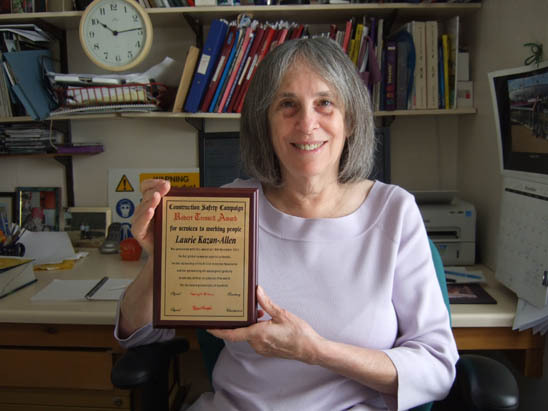 Other asbestos activists who have been similarly honoured over the last decade include Alan Dalton, Simon Pickvance, Paula Walker, Annie Thebaud-Mony and Michael Lees.